A. First of all, email or call with your requirements to make sure that we are available on your wedding date and can accomodate your booking. We'll get back to you right away, and if you are happy to go ahead we will provisionally hold the date for you, and send you a booking form along with our terms and conditions and any sash colour samples you might like to see. Simply complete the forms and return them along with your deposit (£50.00) and your booking is confirmed! Q. What decorations for the chairs can I choose from? A. Beautiful organza, satin or lace bows are included in the standard package price. If you are looking for something a litle different our lace overlays are stunning, and our ribbon bands can add a splash of colour and a touch of luxury. We can also provide flowers, diamante brooches, sparkle bands, burlap bows and beautiful chair hoods . . . and much more! Q. What colour bows can I choose from? A. We have a very large range of colours for you to choose from. Fabric samples are available on request so that you can choose the perfect colour. We have beautiful lace sashes which can be used on their own or over another sash as an overlay. Q. Our guest numbers are not final, so we don't know exactly how many chair covers we will need. When should we confirm our final numbers? A. 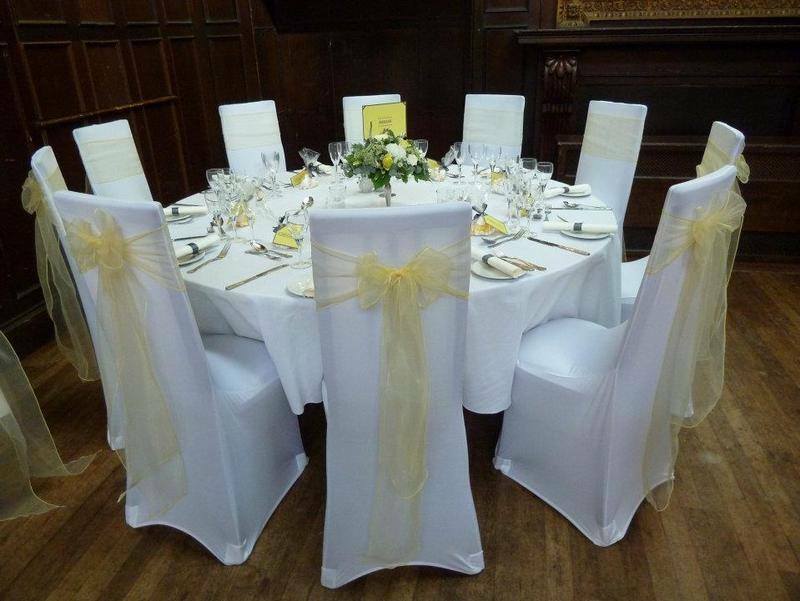 When you initially confirm your booking, we only need an estimated number of chair covers required. We will contact you to confirm your numbers four to six weeks before the big day, though your numbers can still be tweeked after this. Your final balance will be for the total number of chair covers required. If your numbers go down within 14 days of the event unfortunately we are unable to issue a refund. A. Yes, a non-refundable deposit of £50.00 is required to confirm your booking, and should be sent along with your completed booking form. Q. When do you require the final payment? A. Four to six weeks before the event we will contact you to confirm numbers, and your final invoice will be sent. Payment should be made in full at least three weeks before the event. A. We accept payment by personal cheque, cash, or by direct bank transfer.